This is the audiobook version of The First Eagle, published in 1998 by Recorded Books Inc., Prince Frederick, Maryland. It contains six audiocassettes with the full, unabridged novel narrated by George Guidall (7.5 hours listening time). 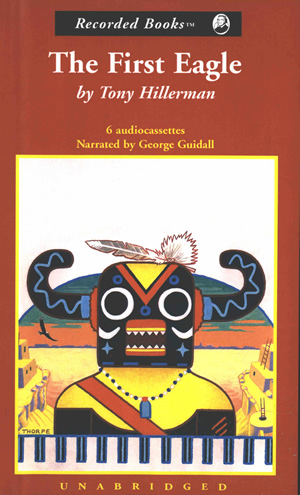 The case art is Peter Thorpe's original drawing from the novel first edition featuring a kachina masked figure, which somewhat resembles Ahote kachina, standing in front of a half moon shaped frame containing a Pueblo cliff village and an eagle swooping through a southwestern sunset. The back cover of the case displays text regarding Hillerman's work and the novel in particular. A detail of Thorpe's drawing is also included. Publisher contact information is printed at the bottom of the back of the case.